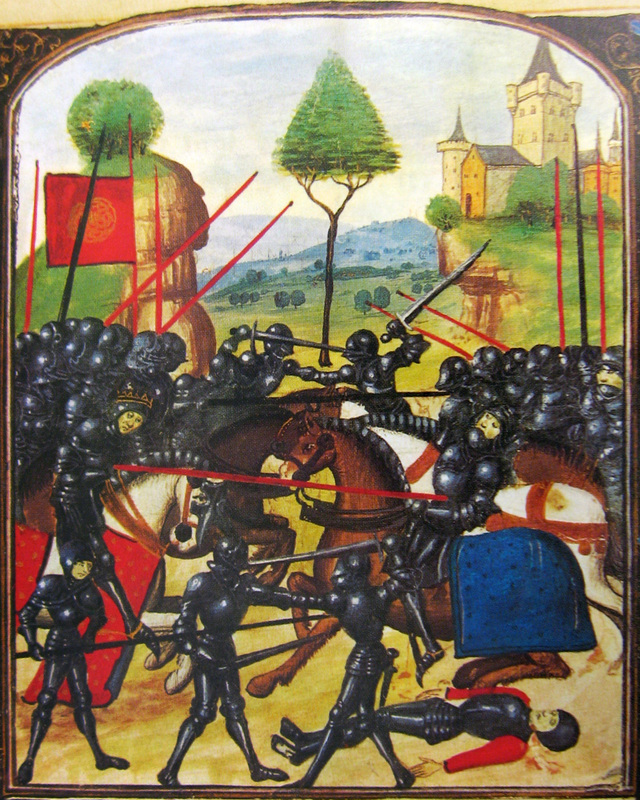 Late 15th-century artistic portrayal of the battle: Edward IV (left), wearing a crown and mounted on a horse, leads the Yorkist charge and pierces the Earl of Warwick (right) with his lance; in reality, Warwick was not killed by Edward. 14 APRIL 1471 — the battle of Barnet. Warwick, who had joined with Margaret of Anjou, fought King Edward IV. On this field, Sir Richard Neville, 16th Earl of Warwick (great-uncle to Sir Thomas Parr of Kendal, father to Queen Katherine) AND Sir Thomas Parr (great-uncle of Queen Katherine) died. Uncle Thomas Parr, who had previously fought with Warwick, fell fighting along side the Duke of Gloucester (future King Richard III); fighting for the House of York. This entry was posted in The Family of Katherine Parr, The War of the Roses (1455-1485) and tagged 14 april 1471, battle of barnet, Earl of Warwick, earl of warwick death, great-uncle to Queen Catherine, great-uncle to Queen Katherine, great-uncle to Sir Thomas Parr, Parr family, sir thomas parr, War of the Roses by tudorqueen6. Bookmark the permalink.